A Fuel, National Theatre and Leeds Playhouse co-production. Currently touring the US and Canada. UK tour to commence in 2019. Fuel has produced Inua Ellams’ work for theatre since his debut play nine years ago. 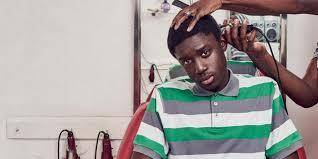 Barber Shop Chronicles is a heart-warming, hilarious and insightful new play, set in Johannesburg, Harare, Kampala, Lagos, Accra and London. The play invites the audience into a uniquely masculine environment where the banter may be barbed, but the truth always telling.